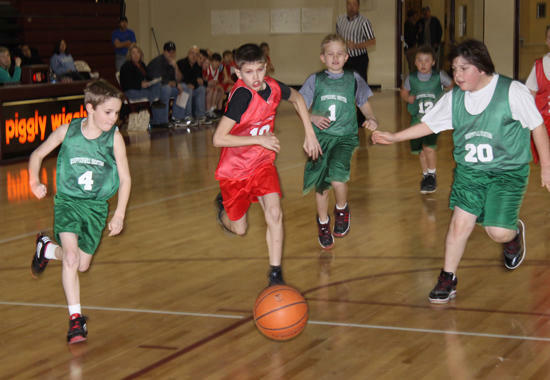 The first round of the Cannon County Youth Basketball Tournament was held Tuesday evening at CCHS. Competition continues (weather permitting) Saturday morning and next Tuesday evening. Malia Watts blocks a pass from Kyla Anderson. Tori Knox evades the Briar Rose defense. Emily Beaty dribbles toward the State Farm basket. Possession slips away from Shelby Earls. Tyler Thomas takes a shot. Treyton Fann works his way down court. Ashlyn Montrose eyes the ball as Rachel Reed moves it into shooting position. Abi Taylor pivots to retain posession. Hannah F. navigates the defense. Bailey Goin moving down court. Treyton Fann leads Red offense. Black gets some advice from their coach. Lexi Melton takes a shot.